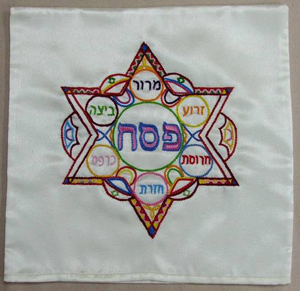 An Ethiopian embroidered matzah cover. Why does Passover bring a secret smile to many Ethiopian-Israeli women? Because it is believed in certain circles that Moses had an Ethiopian wife (Numbers 12:1). Around their seder tables, these women have stories of two great exoduses to the Promised Land - that of the Israelites from Egypt, and that of their own family's escape from Ethiopia. Many American seder-leaders weave in discussions of modern Jewish plights and persecutions, making the biblical Exodus resonate more deeply around the table. One such is the Israeli rescue of more than 22,000 Ethiopian Jews over the last two and a half decades. Here are some ways you can enhance your seder with the Ethiopian experience. Tell The Story - Operation Moses in 1984-85 brought 8,000 Ethiopian Jews to Israel, most of whom covertly trekked through Sudan under horrendous conditions to get to their rescue point. In 1991 Operation Solomon airlifted another 14,300 to Israel in a matter of days. The ongoing struggle to integrate the now 100,000-strong Ethiopian Jewish community into mainstream Israel society underscores just how complicated the process of liberation can be. You can research Ethiopian Jewry for your seder on many websites, such as the Israeli Association of Ethiopian Jewry site. For an excellent series of articles about Ethiopian Jewish history, click here. More can be gleaned from a book filled with beautiful photographs, Ethiopian Jews of Israel: Personal Stories of Life in the Promised Land. Ethiopian Jews of Israel: Personal Stories of Life in the Promised Land. Seder Table Decor - Consider ordering unique Ethiopian Jewish folk crafts from Israel - for your table, or for a host-gift. Adisia (Amharic for "renew your tradition"), a cooperative of 20 women embroiderers in Afula, northern Israel, produces hand-embroidered matza covers, table runners, mezuzahs and more. For product information and to order, email: adisiasales@gmail.com. Order by April 7 for arrival in time for Passover. The proceeds give the Adisia women income for their families and pride in their tradition. Children's Activity - Here is a creative activity to help children grasp the notion of the oppression of the Ethiopian Jews, recommended by Shoshana Zonderman, director of the Harold Grinspoon Foundation's Sulamot Family Education Program. Ask the children to list all their favorite things to do. Then have them share what it would be like not to be allowed to do those things and how it would feel. Then look back at their list and discuss which of these things could not be enjoyed by Ethiopian Jews because of their economic and political oppression. Special Prayer - You might want to include a traditional Ethiopian Jewish prayer at your seder. The following one comes from the Foundation for Family Learning, headed by Rabbi Barry Dov Lerner, on the website. Do not separate me, O Lord, from the Chosen. From the joy, from the light, from the splendor Let me see, O Lord, the light of Israel, And let me listen to the words of the just While they speak about the Law. To teach fear of thee, O Lord, King forever. Thou art blessed, O Lord, be merciful to me. By day be Thou my shepherd and my guardian by night. When I walk be my guide, when I sit be my guardian. When I call Thee, keep Thou not silent. I love Thee, hate me not; I have confidence in Thee, abandon me not.